Dear Parents and guardians,We kicked off last weekend with a hugely successful Spanish Department dinner. This event, which has grown in size over the years, hosted 90 people to a sit-down meal at Las Camellias in Torreguadiaro on Saturday evening. The fundraiser blended wonderful food with great music and entertainment. Congratulations to the team who raised 2500€ that will go towards Hogar Betania’s irrigation project. On Sunday we received excited communications from the Under 18 football team in Portugal. They were through to the finals of the Algarve Cup! The boys, who were reigning champions and always a challenge for the other teams, won a hard fought final, retaining their title. I would like to thank Mr. Gibson, Mr. Ash and Mr. Kevin Dennis for their support and hard work over the last few weeks and the weekend. In our drive to make The Kindred Project a student led NGO, last week we finally agreed roles for the KP Student Leadership team. I would like to congratulate Jamie Templeton and the KP team for their perseverance in creating this structure. Nele Winkleman and Jacob Stewart–Kellet will be leading social enterprise projects. Congratulations to all of the students involved! The Dreaming Dragons (a student led initiative) have been working with Eccolo to create chocolate gift packages for Christmas. All proceeds will go towards kickstarting the Educational Sponsorship programme for Tsa’chila children in Ecuador. Please click on the link below to read more information and order your package before they sell out! On Monday Mr. Mungles led the University Convention. We welcomed 31 Universities from Australia, Europe and the USA to meet our students and students from 8 other international schools along the coast. I would like to congratulate the students who helped Mr. Mungles throughout the day, everyone I met commented on how helpful, polite and knowledgeable they were. I would remind you that this is a long weekend. The school will be shut on Monday and Tuesday next week, but open on Wednesday, Thursday and Friday with normal school days. This week Primary has seen three year groups taking advantage of our local community and taking part in unit based trips. EC2, P4 and P6 all spent days out of school. During these days they were able to connect and extend their learning to the real world. Making authentic connections such as these are invaluable to the whole learning experience. In next week’s newsletter we will share more information about these trips. P6 students visited the science lab with Mrs. Kearney to test different brands of chocolate for their melting points and fat content. Then in class the students plotted line graphs to display the data collected from the experiment. Exploring and comparing the melting points of different chocolate brands enabled the students to observe that the scientific testing of products is important. P6 had a great start to the week by having James Easterbrook come in to share his expertise on marketing. His presentation was not only interactive and fun, but also extremely informative and relevant to our learning. This being the fourth week of this unit, P6 were able to reflect on what they had already discovered and begin to make connections. Yesterday morning children’s author Anna Bogie came in to school to read to our youngest children. These children have all taken home an order form, and if you would like to order a signed, personalized copy, please return the form with the money on Wednesday next week (7th December), orders will be delivered the next day. In case any parents with older children might like to buy, perhaps as a present, please click on this link for more information about the books and to download an order form. We are pleased to announce that the Cub Scout group, which had to close earlier in the term, has found some new leaders so will restart next term. We already have 7 boys on the waiting list, however please note cub scouts is open to boys and girls between the ages of 7 and 10 and a half. 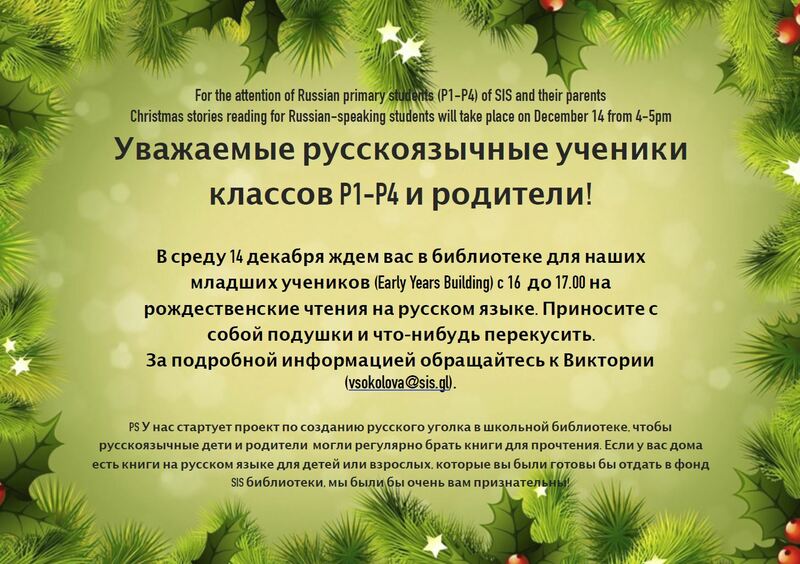 Please click on the below link to read the next addition of the Primary News. This is a newsletter written and edited by students. On Tuesday 29th November M3 students had the opportunity to demonstrate their learning from their investigations into refugee camps. This has been an incredible experience for the enthusiasm, rigour and eagerness to learn shown by the students. They learned about the basic necessities a country has to provide for a refugee population and transmitted this information to the parents and teachers who visited us. It was lovely to hear the creative and innovative ideas of the students, showing oral skills in their presentations and a high level of skill in the use of new technologies. Understanding what happens does not change what happens, but helping to understand what happens to a child is still necessary and in that sense education must emphasize the injustices suffered by children, children of the world, children of Syria. A parent Liz Howse came in to speak to the M4 students about her experience of having type 1 diabetes, dialysis and a kidney transplant. This directly linked to the unit that they were studying about homeostasis, osmoregulation, the role of the kidneys, glucoregulation and diabetes. The students were engaged throughout and eager to question Liz to find out more. International Schools Algarve Cup – SIS champions again! SIS Under 18 team headed back to the Algarve last weekend as holders of this prestigious cup. Over 3 days and a total of 10 matches, SIS battled their way through to the final to be crowned champions with a 2 – 0 victory. This Monday was the University Convention, with 31 universities in attendance and 8 other international schools participating, meaning around 750 students passed through the convention over the course of the day. In addition to the Convention in the gym, there was a session on applications to the Netherlands, followed by one on the role of sport at university. At lunchtime there was a session for teachers regarding tips for writing a great reference. All of the university admission teams spoke highly of the organisation and motivation of the SIS students. Parent ambassadors and D1 students played crucial roles in supporting the convention, and my thanks goes to them and to the myriad of support staff over the course of the day. In U&C we will be building on the insights that the students gained into the application and preparation process in follow up U&C sessions. ASSIST is the SIS relocation and concierge service for families of the school. Your Assist membership card is at the back of the SIS security access card. Our second NADFAS lecture this school year will take place in Picasso Art room 2 at 2.00pm on December 14th. Parents are invited to join our Diploma Visual arts students for this lecture. 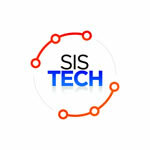 Please email Margaret O’Farrell mofarrell@sis.gl if you would like to attend. “Would you like to develop your confidence in looking at Art? Do you want to discuss your opinions with insight? Put away the headphones, take your nose out of the catalogue and discover a strategy for looking at Art. The strategy is a flexible approach to interpreting any piece of artwork, giving you the confidence to become an active, rather than a passive, viewer. It is a tool for life: simple and effective. We will put it into practice by looking at a range of works from across the history of Western Art. Your questions and observations will be welcomed and encouraged. This lecture is a must for anyone interested in visiting galleries, exhibitions and art museums. It will, quite simply, help you to ‘see’ more! Learn to trust your own eyes, and enjoy Art to the full. .” Lynne Gibson. We are looking forward to an amazing afternoon of fun and entertainment next weekend, and are working hard to give everyone an event to remember. As always, we need your help! We have some amazing prizes, including an iPhone 7, a night in a Superyacht Junior suite with dinner in the Sky Restaurant courtesy of the Sunborn Gibraltar, and an Xbox One S with Minecraft game! Raffle tickets have been sent home today with the students. Please look out for them! Need more? Please see Anne in the library. Next Friday, 9th December all students can wear their own clothes in exchange for a donation for our tombola. We are looking for donations of new gifts, chocolates, etc. that can be used as prizes. Last Friday students raised a whopping €912.50 that will go towards sponsoring their students at our partner school Nabugabo Community Learning Centre in Uganda! Thank you for your ongoing support and for bringing in your euros, you really are making a difference. One more year, the SIS Spanish Department organised it’s annual charity dinner in favour of Hogar Betania. We raised a total of €2.500 which will go to our Garden Project in Hogar Betania; to pay for the entire irrigation system! Here is the link with the THANK YOU video we prepared for the dinner. We hope you enjoy it! Alfabara, Algetoner, Aloha, Amellie, Arkitects, Arnica, Baelos, Barranco, Bezal, Bodegas Collado, Centros Unicos, Chapela León, Darte Pilates, E-Tapa, El Almacén del Puerto, El Motor 2, Esmeralda, Veterinaria Fábula, Farmacia de San Enrique, Fashion Kids, Federópticos, Florium Sotogrande, H2Sol, Helicópteros Sanitarios, Itsomi, La Maison de la Tarte, Los Arqueros Club de Golf, La Terraza de Teo, Laboratorio Rafael Ochando, Las Tartas de Mariana, Lema, Lidia Benitez, EMS, SotoArkitecnia21, New Long Man’s, Midas, Restaurante Moncayo, Peluqueria Tokke, DBlanco, Sotogrande Farmacia, KE, Lola Peluquería, Club Marítimo de Sotogrande, Mary Kay, Mesón Las Duelas, MO, Muelle 44, Ofipress Papelería, Ortega Avilés, Ragazza Modas, Rami Electromecánica, Reprotek, Sotogrande International School, Sodexo y Seg Way! Nice easy 5km flat course in your bright red Santa suit!!! 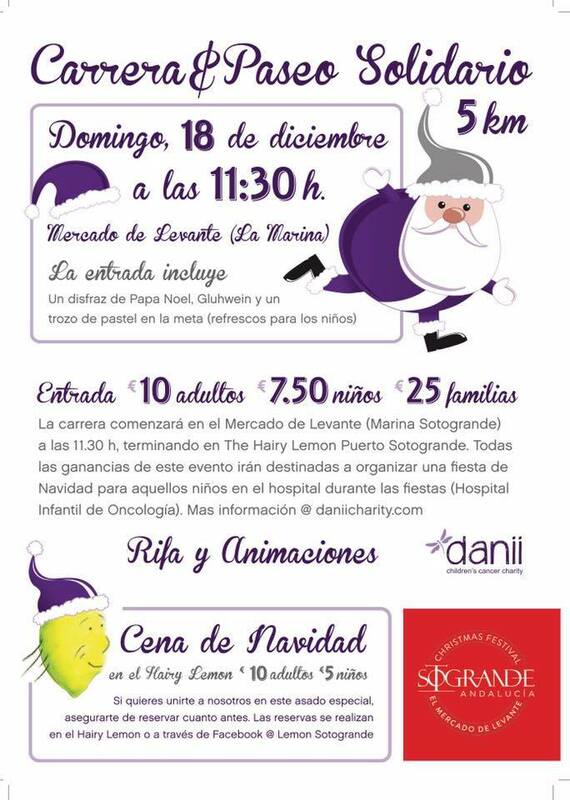 All proceeds will go to fund the Christmas Party for the Children’s Oncology Ward in Sevilla. Danii’s Children Cancer Charity will provide clowns, magicians , food for 40-50 children and their families; something that will definitely bring fun and a smile for the kids while they undergo treatment during the festive period. We also provide presents for Three Kings as well. 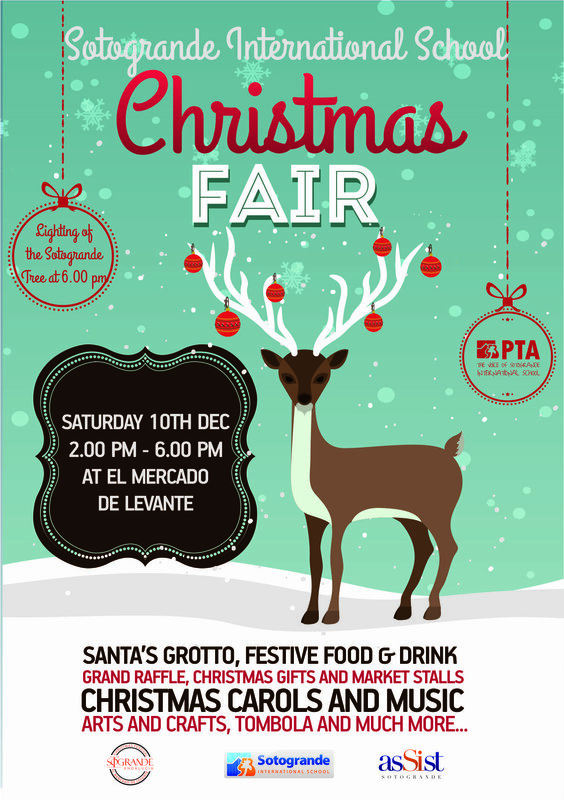 Hope you can all make it, plenty of Santa suits as this year we got major sponsorship from Sotogrande SA who have added the event to their Christmas Calendar. We will be selling Santa suits at SIS and at the Hairy Lemon plus at the Marina on December 10th. 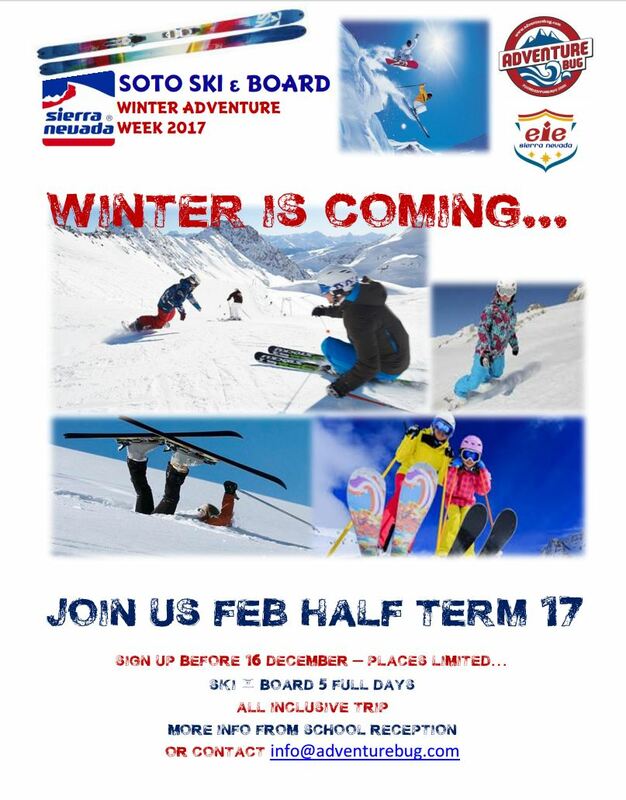 We are once again pleased to offer our annual ski trip to Sierra Nevada, taking place during the February half term. This trip is offered by Adventurebug S.L. who have been taking SIS students skiing every winter season for the last 14 years. Sign up forms and trip information is available from the main reception or contact info@adventurebug.com direct for the registration pack. Deadline for registration is 16 December 2016 and spaces are limited!